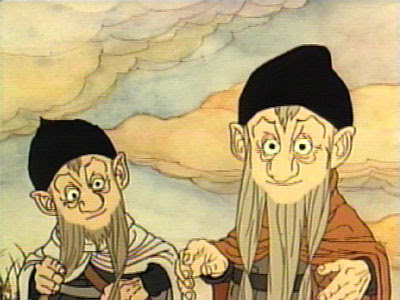 Here are a few still from the 1977 Rankin/Bass cartoon adaptation of The Hobbit, which illustrate the way some of the dwarves were portrayed. The ones in the top picture don't look the youngest to me. The ones in the bottom picture look the youngest to me. And, in each picture, I'd have a very hard time telling one of the dwarves pictured from the other. So I don't think the animators did a good job of visually distinguishing each dwarf from the others at all. But how really important is it to be able to distinguish one dwarf from any other in The Hobbit anyway? Haven't seen the cartoon in years. How prominent were the individual dwarves in the Rankin-Bass version? I don't really recall anything in particular about many of them outside of Thorin, other than as side characters to get repeatedly captured and rescued. 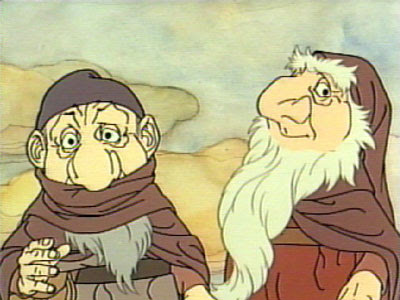 Does it really matter which dwarf is Oin and which is Gloin in the cartoon? Curious if Jackson has more planned in terms of filmed roles for each dwarf so he wants to keep them physically distinct as well? many, many flaws, both as an adaptation and as a work in its own right. Pshaw! At least they had songs. Jackson had only one per movie! Disagree! 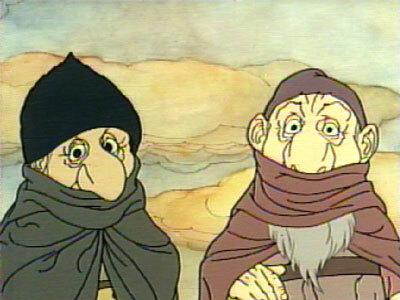 The Rankin/Bass Hobbit was one of the most influential animated films in my formative years. I recently got the DVD and watched it with my daughter and she loved it too. In many ways it captured the spirit of the book more than Jackson's LotR did. Compared to the Bakshi tragedy, the Rankin/Bass version is pure genius. And even though I do cringe a fair bit when I watch it, to me Bilbo Baggins just IS as he's depicted in this animation. When I read the book, I just can't help but imagine him this way. I really like the Rankin-Bass version, since it was my first introduction to Middle-Earth. Yes it does have many problems, but it inspired me and many other kids to read the books. I really love the animation style that RB had. I remember being awed by The Last Unicorn in the theater. Plus they did Thunder Cats and Silver Hawks! Bombur and Thorin were the two dwarves that really stood out in the series. Count me in as another fan of the Rankin-Bass character designs. I liked them a lot, and they're a big part of the reason why the new dwarf costumes irk me. judging by the text that's accompanied the marketing stills of the dwarves from the new jackson flick, he's actually giving each dwarf a well fleshed-out back story. It's interesting, and suddenly it strikes me that our urge these days is to see the same stories told over and over again with ever more "novel" characters in them. Who knows what evil lurks in the hearts of men? Dori knows! My dad bought our first color tv in hopes of getting it before "The Hobbit" aired (it didn't get delivered on time). Sure it's got problems, but Richard Boone is suitably monstrous as Smaug and John Huston's Gandalf would never have failed to figure out the riddle of Moria's gate before Frodo. For all the flaws in character race design (the wood elves hurt my brain), the look of the clothing so much better captures the ancient Germanic (Gothic/Frankish/Saxon, etc.) vibe I get from the books than do the designs of Peter Jackson. Jackson's various dwarves look like they stepped off of the pages of the latest WotC tome or the cover of a Forgotten Realms book. They look simply too generically "fantasy". In an effort to look dark or more original they look like too much of everything else. Note - I actually love that Rankin and Bass' dwarves come in matched sets. It's the feeling I always got from their names in the first place. Personally I didn't like the Rankin/Bass Smaug. He seems too boorish. I'm hoping the Jackson version will be more suave. "But how really important is it to be able to distinguish one dwarf from any other in The Hobbit anyway?" Exactly. This is the point being missed, IMO. There isn't a real need to distinguish the dwarves from each other. I'd go so far as to say that one of the points made was how similar the dwarves were to each other. The songs were fabulous. I didn't understand why they were in the book until I saw this adaptation. My problem was with the fight scenes; the whirling doom that enemies were sent to detracted from the message of the story: that violence is not glorious. I like this better than the over the top Jackson adaptation or the Backshi cartoon. Everyone seems to forget that Tolkien has probably based his dwarves on the Welsh miners. I enjoyed reading The Hobbit. Actually forced myself to read the whole of the Lord Of The Rings, where World War One overshadows any spirit of fantasy. The WORST part of the Jackson film adaptation was the computer animation of the massive battle scenes. It was so obviously computer generated, made me appreciate the mass choreography of the battle scenes of the Alexander Nevsky. Computer aided graphics also killed the Star Wars pre-cuels for me. Empire Strikes Back was the best of the original three for me. Looking forward to The Hobbit. Hoping it will be different than Jackson Blockbuster Part 4. Tolkien based his dwarves on medieval stereotypes of Jews mixed with mythical Norse dwarfs. I don't know about Welsh miners. Not very, in my opinion, since Tolkien himself painted most of them with very broad strokes. Only a handful have distinctive enough personalities to warrant worrying about making them all look distinct. In many ways it captured the spirit of the book more than Jackson's LotR did. Oh, I agree with this point very much, but there are still enough changes and omissions to the story that I find it hard to wholeheartedly endorse it. I'm petty that way. he's actually giving each dwarf a well fleshed-out back story. Which is absurd on numerous levels. Very true. Middle-earth is a very Northern European kind of place, at least the parts of it that are important to the two novels. I would prefer it if the character and costume design reflected that. 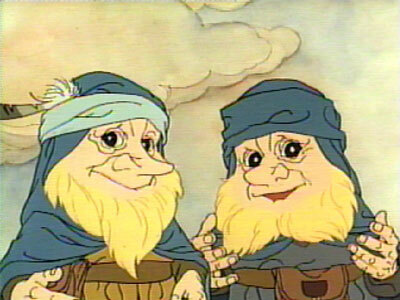 As I said, the Rankin/Bass cartoon is flawed in many ways, but I think it did a decent job with the dwarves. They hew pretty closely to what Tolkien wrote and they make the characters as distinct as is necessary for the plot (which isn't very distinct in some cases, admittedly). "but there are still enough changes and omissions to the story that I find it hard to wholeheartedly endorse it. I'm petty that way." Not petty at all. I wholeheartedly admit my fondness for this movie is based on my childhood encounter with it. The changes are significant and frustrating and I felt it even at the time. As to John not liking Richard Boone's characterization, I like its "crudeness". To me Smaug is a murderous horror and any effort to polish that up with fine talk shouldn't hide that. I couldn't buy it if he sounded like James Mason. Smaug is a monster, but he's an intelligent and cunning monster. Richard Boone's Smaug never seemed like he was a danger just to converse with. Plus, I can't buy that accent. Since Peter Jackson is apparently making 2 movies out of the Hobbit, I suspect at least some of the Dwarves are going to have backstories/subplots in order to fill out the running time. I mean, that's probably four hours of cinema to tell a story I thought could be done comfortably in 90 minutes. At this point, I'm wondering if these films are going to suffer from "King Kong"-style adaptation bloat, with the story getting lost amidst character pieces. Well, with any luck, most of the extra run time will be fanfic about the stuff in the background with the Necromancer gathering his forces and then running off to Mordor, or possibly The Flashback Adventures of Belladonna Took, Hobbit Ninja!, or Tauriel the Orc/Vampire Slayer. The dwarves aren't really cowards, or greedy monsters. They're people who were raised in an advanced civilization, forced to run for their lives as teenagers across hundreds of miles, who then did coalmining for a living as the poor relatives. They work their way up to being businessmen instead of blue collar. Then in middle age, they finally get a chance to get their own back, in both senses. To avoid their fear, they proceed to treat it like just another a business trip instead of a death-or-glory mission. Then the realities of the situation repeatedly hit them, and they react almost totally from gut emotion. As most people would. They're just these guys, you know? Miners and traders, people with jobs. They're not adventurers, any more than Bilbo is; their heroic sides are buried in exactly the same way. The only good thing about the animated movie, to me, was John Huston's voice. The dwarves were too silly and goofy-looking. The dwarves in the book were serious people. Much love for the Rankin-Bass version. Excellent sound design and voice acting. That's a brilliant take, suburbanbanshee. Nice insight.